The black walnut tree (Juglans nigra) produces a natural phytotoxin called juglone in its roots, leaves, fruit, hulls, and bark. This substance is not secreted into the soil but rather, remains in the plant tissues and is most persistent in the roots. 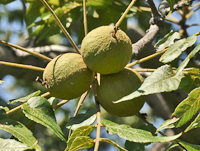 Other nut trees such as hickories and other species of walnut also produce the toxin but it is not as potent as it is in black walnut. The roots of plants susceptible to this toxin must come into contact with walnut roots or other tissues for symptoms to develop. Some plants such as tomatoes are extremely sensitive to juglone while other plants appear not to be effected at all. On average, the toxic zone extends over the entire root zone of the tree which may extend 60 feet or more from a mature specimen. 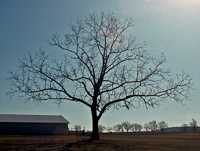 Near established groves of walnut trees, the toxicity may occur for a distance of over 80 feet. The toxin will persist in the soil for up to 3 years after a tree is removed. Total removal of the soil in the root zone is a drastic (and expensive) alternative in extreme cases. Controlling the spread of the tree roots with solid barriers is another option, but with highly sensitive plants, other walnut tissues (i.e. leaves, bark, etc.) may still prove toxic. Symptoms of toxicity range from stunted growth, partial or total wilting of the plant and, in severe cases, death. Affected plants often appear to be growing well, then suddenly wilt or die. Plantings in the root zone of young walnut trees will experience toxicity as the tree matures and the root system expands. Walnut trees are relatively fast growing, produce edible nuts, and make a formidable statement in a landscape. Considering the value of any mature tree, it is better to consider using compatible plants in the landscape rather than removing large, existing walnut trees. Planting new walnut trees should be avoided on small lots or near houses. 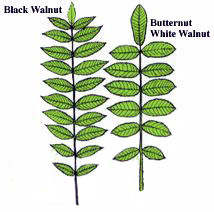 Other species in the walnut family containing juglone in lower concentrations (listed in order of decreasing concentration of juglone) include: English Walnut [Juglans regia], Butternut [Juglans cineraria], Shagbark Hickory [Carya ovata], and Pecan [Carya illinoinensis]. 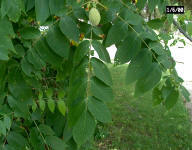 Refer to a lists of plants that have been observed as being either susceptible or resistant to the effects of juglone. Although these lists contain the names of many plants, they are certainly not all inclusive. Many plants have either not been observed or reported as to their response to contact with the roots of walnut trees.